All Booked Up is a bookstore with a large selection of new and used books. The store has friendly knowledgeable staff, a large selection of new and used books, and a beautiful calico cat named Dori. 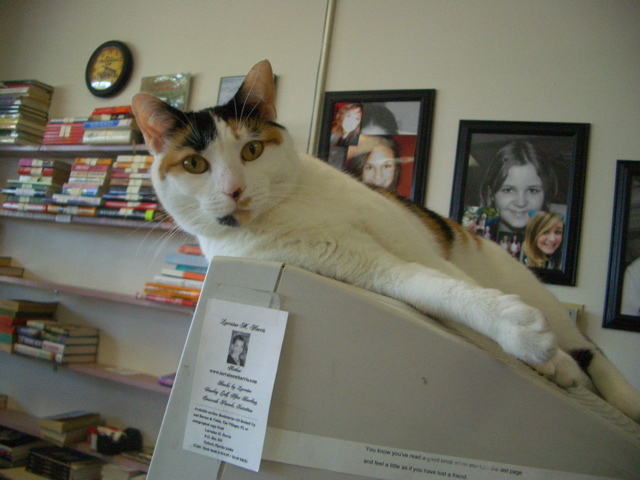 When I walked into the little bookstore a large calico cat was sprawled out on top of the computer monitor. He had a regal pose, like an Egyptian spynx, and established dominance over the register. Some customers ignored the cat and some even thought he was a stuffed replica of one. He did not have me fooled, however, and I stroked his body hoping for good luck. I had remembered from my reading that Japanese sailors often carried calico cats on board their vessels because they believed the cats would bring them protection at sea. These cats were also believed to bring good Luck to homes for anyone who had one. As the cat stretched out longer and longer, all four of his legs loosely dangled over the monitor and she kneaded the air with all of her four paws. She did not resemble a good luck charm you would want to wear around your neck but I was still awed by his silent wisdom. There is a golf cart parking space in front of the bookstore for the shopping center. During the day, there is a steady flow of shoppers who park their carts in front of the bookstore. Atop the register and through the window Dori is able to recognize which carts will bring treats and which shoppers will bypass the bookstore and shop elsewhere in the shopping plaza. One of the few times during the day the cat leaves her perch is to meet the customers who bring her treats and meets them at the door. The rest of the day she stays sprawled out atop the register. Dori has a serendipitous association with names and this would help me in the sale of my newly published book. “My name is Dori too,” she said in a faint voice. Bored with the conversation the cat stretched longer and longer until it was ready to fall, then it shrunk thinner and thinner to regain it’s dignity. Shop owner and daughter Madison did not come with a preconceived method of selecting a cat that day at the Millennium Mall. As they walked through the shelter passing cat cages, they finally came to an open area where several cats were resting in various spaces. They were looking for a sign that would direct them to the right cat. Suddenly from high above, a perch a cat reached out and pawed at daughter, Madison. “Tell us about that cat,” Jodi asked the shelter attendant as the cat continued to reach out to them with her paws. “Her name is Madison” the attendant replied. Would you like to H.0.l.d her? Madison the cat went home with Madison the daughter. Shortly afterwards the cats name was changed to Dori, as to not confuse the household with two Madison’s. The day I returned for my book-singing visit to the shore, Dori was in her usual place watching the check out of books. While I set up my table for the book signing (without treats) the cat slowly worked her way across the counter and sat down on top of my book-signing desk. “Very appropriate,” a women standing in line with two of my books in hand said, as she glanced over at the cat resting on my table pawing her way gently through my bookmarks. Dorie’s favorite place that morning was not on the monitor but next to me helping with the book signings She did not leave my side until all the books were sold. Very shortly after I arrived I ran out of books and it was time to bid farewell to my cat Friend - my good luck charm – because I ran out of books. When I left, I glanced back and silently communicated my appreciation to him. The cat looked back at me with sad eyes and I knew I would have to return very soon with an arm full of new books.